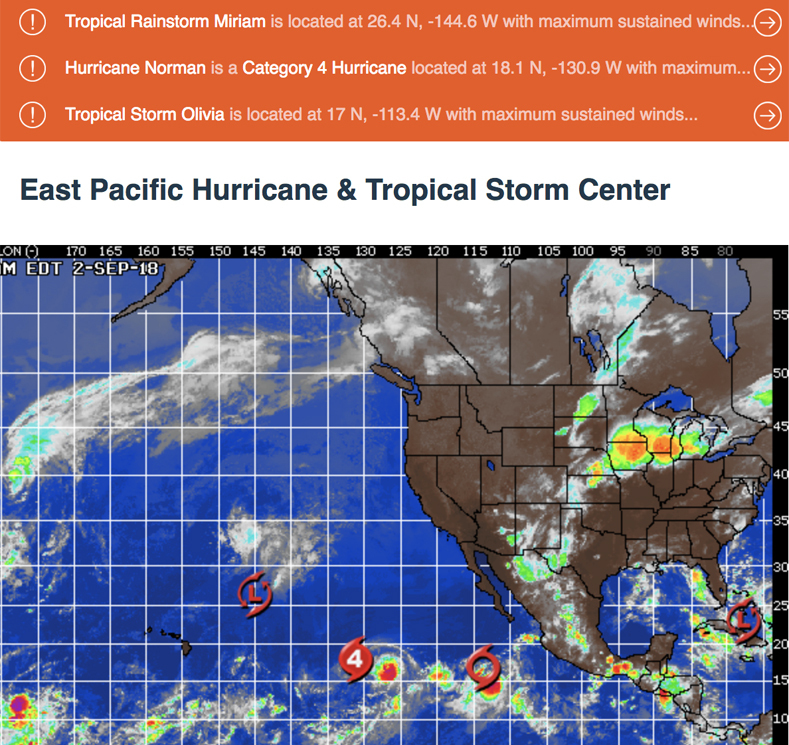 Norman is currently a Category 4 hurricane around 1,400 miles west of the southern tip of Baja California. Norman will maintain its strength for now, but should gradually weaken later this week as it moves into an area with cooler waters. Although Norman poses no threat to land at this time, it may track nearby to the east and north of the Hawaiian Islands late this week. In the Central Pacific basin, Miriam has degenerated into a post-tropical low and is now centered about 810 miles northeast of Hilo, Hawaii. Miriam will pose no direct threat to land as it progresses off to the northwest. Tropical Storm Olivia is currently centered 470 miles to the south-southwest of the southern tip of Baja California. Strengthening is expected over the next few days and will likely become a hurricane on Monday, perhaps even becoming a major hurricane (Category 3 or stronger) by the middle of the week. At this time, no direct impact to land is expected over the next seven days. Also, another area of low pressure will develop by the middle of next week well south of the southwestern coast of Mexico, to the east of where Tropical Storm Olivia currently is located. This future low may develop into a more organized system late next week as it tracks off to the west-northwest. For Monday morning we’ll see continued Hurricane swell roll in from a slightly more Westerly angle of 185-190 degrees and it should deliver inconsistent, waist to chest high surf for the better South facing breaks. We’ll also see some steeply angled, NW wind swell in the knee to waist high range. The conditions look okay with SW breezes at 3-6 MPH until noon and 9-10 MPH out of the SW in the afternoon. The air temp dips to 73 degrees. For Tuesday morning I will tentatively call for continued waist to chest high surf from 190-195 degrees and knee to waist high NW wind swell for the better West facing breaks. The conditions look decent again with 2-6 MPH breezes out of the SW until noon and 9-11 MPH out of the West in the afternoon. The air temp dips to 72 degrees. For Wednesday morning we’ll dip into the knee to waist high surf up and down the coast. The conditions look about the same with 1-5 MPH breezes out of the SW until noon and 7-10 MPH winds out of the West in the afternoon. The air temp tops out at 74 degrees on the sand. For Thursday morning we’ll see another burst of tropical swell courtesy of Olivia. This energy will put the top South facing breaks into the waist to chest high high zone. The conditions look decent with variable winds in the 2-6 MPH zone until noon and 9-11 MPH breezes in the afternoon. The air temp tops out at 75 degrees. For Friday morning we should see a continuation of that tropical Olivia energy. The better South facing beaches should see chest high sets but nothing is etched in stone just yet. Stay tuned to see where the Hurricane rolls! The conditions look pretty good with SW breezes at 1-5 MPH until noon and 7-9 MPH winds out of the SW in the afternoon. The air bumps up to 79 degrees. Water temps are are fluctuating a little bit! (day of 4CAST update) and are as follows: Malibu 65, Santa Monica 65 South Bay 72, Huntington 65, Newport 69.